^CORRESPONDS TO 32 OSQLLATIDN PERIODS OVER THE »32-DEG FIELD OF VIEW f f CORRESPONDS TO 64 OSCILLATION PERIODS OVER THE >32—DEG FIELD OF VIEW. where P is the unit vector along the line of sight of the sensor, E is the nadir vector to the central body, and p is the apparent angular radius of the central body as seen from the satellite. The value of E-P will oscillate sinusoidally approximately once per spacecraft rotation as P sweeps through the sky. The value of E-P —cosp will be zero when the angle between E and P is equal to the_ apparent _ angular radius of the central body, i.e., at horizon crossing times when P = H, or H0. 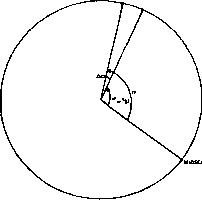 where RE is the radius of the central body. 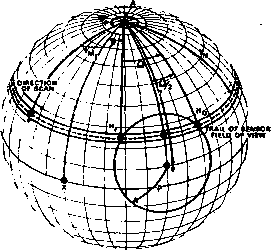 If the central body is the Earth, oblateness may be considered (procedures for modeling an oblate central body are discussed in Section 4.3), in which case RE in Eq. (7-40) is latitude dependent. cosy where y = yN + Ay is the true mounting angle. This is then substituted into Eq. (7-39). This model is not valid in the case of terminator crossings for a visible light sensor; thus, terminator rejection is required. where u is the body rate (again assumed to be constant), n is the number of complete spacecraft rotations between t, and tQ, and fl is the central body width (in degrees), which can be calculated as follows. Here y = yAi + Ay, where Ay is a fixed mounting angle bias. A fixed bias can similarly be included in p.
where p, and pQ are the effective scan-in and scan-out radii of the central body, including all correction factors to the nominal radius. On other spacecraft (SAS-3, for example), the telemetry data consisted of a voltage which was converted to an Earth width, G, from a calibration curve. The assumptions and limitations for the nadir vector projection model hold true for the central body width model as well. In addition, we must assume that the orbital motion of the spacecraft is negligible between in- and out-crossings. This effect is more troublesome for BHSs and PSs than for WHSs because wheel rates are generally much faster than spacecraft body rates. Because both solutions are geometrically meaningful, more information, such as an a priori attitude estimate, is needed to resolve the ambiguity. 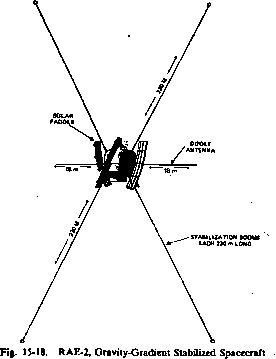 Once it has been relsolved, however, we know that the spin axis of the spacecraft (or of the wheel in the case of a WHS) lies on the cone in inertial space centered on E and of radius ij. where Aa is the azimuthal misalignment of the pickoff from its nominal value. 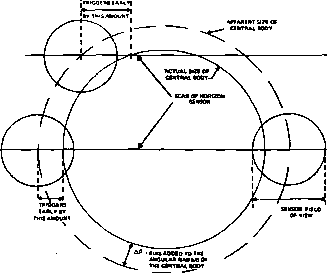 This can be combined with the spin axis attitude to determine the three-axis attitude of the spacecraft, since the spin angle model specifies the azimuthal orientation of the spacecraft body about the wheel spin axis. * Each of the biases described here has been found to have a significant effect on real data for some missions. Fig. 7-13. Bias on Angular Radius of the Central Body difference in triggering times will vary with the path. This effect can be added to the nadir vector projection and central body width models by replacing p with p+Ap in Eqs. (7-39), (7-46) through (7-48), and (7-50).